J. G. Ballards “The Drowned World”, but without heat, that's what came to mind looking out of the car window. 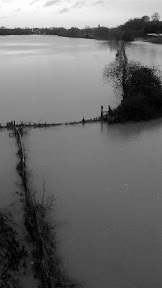 Saturday 29th December was another torrential downpour in a months of floods, in the wettest year in UK weather records. I set out that morning for Cambridge from Hereford. The River Wye had passed it's flood peak at Hereford but the fields by the river were still mirroring the leaden skies as water could not soak away in the sodden ground. 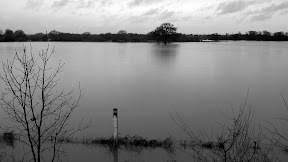 The Lugg meadows at the start of the road to Worcester (A4103) were still flooded as the route gradually climbed higher in a series of undulations. Small streams ran down the side of the tarmac or in the tracks created by the traffic. Where they pooled in the dips in the road or changed from one side of the road to the other, the car would suddenly experience drag and generate fountains of spray. Definitely not a day for fast driving. You could even be unexpectedly caught out at the top, for example when clearing the impressive incline at Fromes Hill. Initially, you could not see the Malvern peaks, just the roiling clouds rushing around them. But breaks in the clouds were rushing up behind me. By the time I reached the Cowleigh Road junction to Great Malvern, I turned off the main Worcester route for a deviation in anticipation of a better view coming off the hills. Cowleigh Road (B4219) was a narrower affair, through orchards and then winding into the woods. 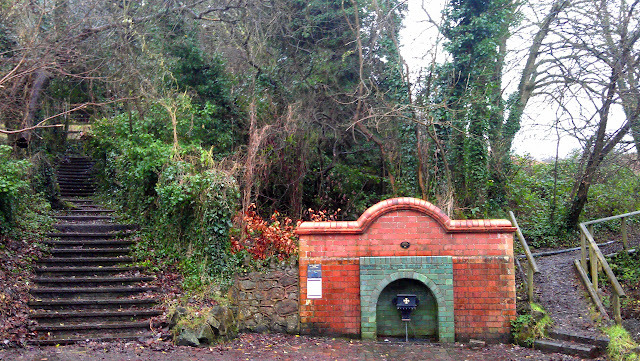 I pulled into the drive to Cowleigh Park farm, intrigued by the Cowleigh Spring on the opposite side of the road. The rain was letting off enough to get out and take a photo. Coming into Great Malvern, I took a sharp left back towards Worcester onto the A449. Large billboards promoted the new retirement villages and the view ahead across the plain towards Worcester looked similarly mundane with no vast floods in evidence. This only changed at the roundabout leading onto the A4440 swinging south around Worcester. We entered the Severn's flood plain. Puddles flowed together into a larger sheets with just the occasional tufts rising above the water. 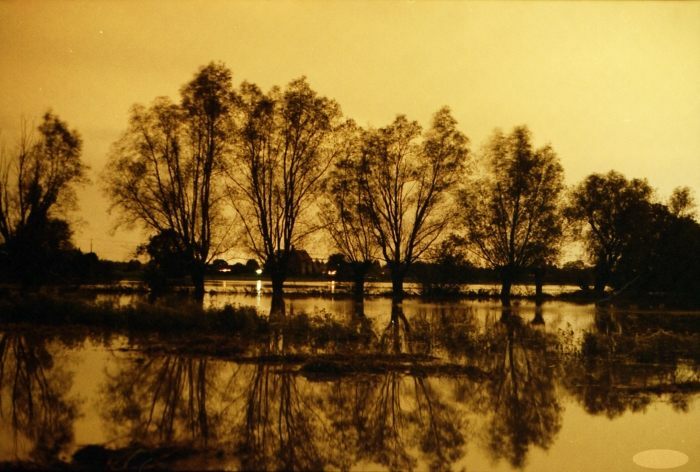 The water continued to deepen so that only hedges and solitary trees rose forlornly above the flood. I pulled out of the stop-start traffic into a small service road, wrapped in my anorak against the rain and wind, to take some photos. The west bank of the river could not be seen, whilst on the other, the river boats were moored just a couple of metres below the caravan site that nestled below the A38 leading into Worcester. I continued along the bypass and made a choice not to use the M5 up to Birmingham, but to continue cross country. Missing the directions to Evesham, I headed towards Pershore then let the SatNav guide me back to the route I should have taken along the Avon valley. 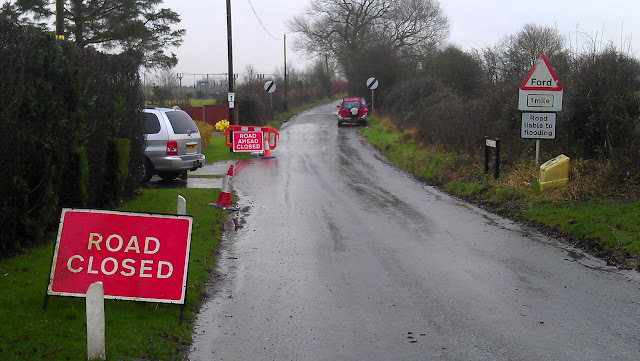 At Drakes Broughton, the suggested route via Walcot Lane had to be abandoned due to a flooded ford that was not worth the risk. Coming into the Vale of Evesham, the Avon had burst its banks and it was more a case of the flooded plain winding sometimes closer, sometimes further away from the road. 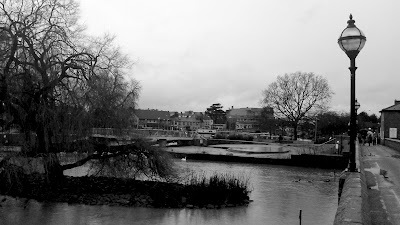 My objective was a stop at Stratford upon Avon as I used to live and work nearby. The rain had not deterred Saturday shoppers and tourists, so it was a crawl to the Rother Street Car Park, where I was lucky to find a space. My first stop was for food; fishcakes in the Hathaway Tea Rooms on the High Street, with a warming cup of tea. A couple on a date to my left and three tables in front taken up by a family group provided light observational entertainment before I grudgingly set out into the rain again. Turning down Sheep Street, I reached Waterside where the Avon was in full flow but still within its banks. 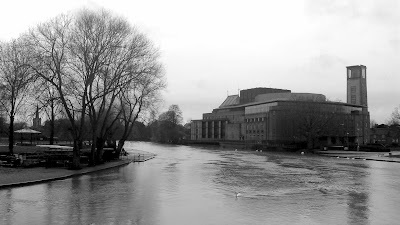 Crossing the lock, I walked onto the pedestrian bridge to photograph the Royal Shakespeare Theatre with the swollen Avon, tinted brown by the sediment it had ripped from earlier fields, rushing by. The colour highlight in this grey day was provided by Dawn and Garry Lloyds's shop on Sheep Street, Gifts & Forget Me Nots (http://www.facebook.com/giftsandforgetmenots?ref=stream). They are the sole local source of Annie Sloan chalk paints for the area. With Dawn's helpful and friendly advice, I left laden with 100ml pots of rich colours and shades for future chalkboard work. Back on the road, direction Warwick, I took a turning to Hampton Lucy, drove through to Charlecote. and then on to Wellesbourne, where we used to live thirty years ago. There, left onto the A429 through Barford in direction Warwick. These villages are all in the Avon flood plain and had suffered flooding in November. The river seemed to be within its bounds now but many fields were still full of standing water. Rain kept falling. Darkness was descending at 4pm as I bypassed Coventry and joined the last stretch of the M6 leading to the A14. Spray from the traffic on the wet roads meant the wipers were on constantly. The first part of the A1 was prone to straight sided, deep potholes, to be avoided if seen in the headlights in time. No doubt the long spells of wet weather increased road damage, especially when follwed by groundfrost that would expand and enlarge any water-filled cracks. Passing Huntingdon Racecourse, I wondered if there had been any relief from the flooding which had led to the abandonment of the Boxing Day Racing. We were now in the area dominated by the river Great Ouse. I could see the glint of reflections on flooded areas as the A14 swung past Huntingdon and Godmanchester. 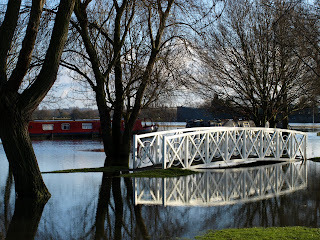 I remembered photographing the flooded Riverbank Park in Huntingdon back in February 2009. St Ives, Fen Drayton and the nearby lakes in the nature reserve had all experienced high water and flooding earlier in December. When travelling to the special A14 Coffee Morning meeting on the afternoon of the 21st of December, I had made a point of taking the guided bus and getting off at Fen Drayton Lakes with a camera and Tripod. Setting off on foot, I soon encountered the water lapping over the footpath, right up to the embankment of the guided bus. Carefully making my way above the floods on the embankment, aside of the guided busway, I was reminded of a scene in the film “Spirited Away”, where the occasional train would swish past on a long track through an otherwise submerged countryside. I had walked on to St Ives, attended the enjoyable meeting and then spent an hour photographing the high water and flooded car park in St Ives. Back to the wet drive in the dark. I was on the home stretch approaching Cambridge. Before I had travelled to Hereford, the River Cam had flooded Grantchester Meadows. However, by the time the Cam reached Baits Bite Lock in Milton, the river was in control again, though very high. In fact the last time we had seen flooding in Milton was back in the days when I still used a film camera, Back in October 2001. I arrived relieved at our front door in Milton after 7 hours travel. The journey had been a transect through central England both in distance and as an encapsulation of the wettest year on record. I was also extremely grateful that, when buying our property, we had checked that we were outside of any flood plain. If you are thinking of moving house or just want to check how safe you are from floods – check the environment agency's site at http://www.environment-agency.gov.uk/homeandleisure/floods/31650.aspx.